The next fiscal cliff: It starts in two months with the sequester and the debt ceiling. Don’t celebrate yet—the next budget crisis is just two months away. The fiscal cliff is dead—but the era of semi-permanent fiscal policy crisis is still with us. Indeed, if anything, the resolution of the cliff has simply served to set up a quantitatively smaller but qualitatively much more terrifying cliff two months from now. That’s when the country once again reaches a crisis over the lapsing of the Treasury Department’s authority to borrow money. Once upon a time, when Congress wanted to instruct the federal government to spend more money than it was going to collect in taxes, it would specifically authorize bond sales. During World War I this was deemed inconvenient, and Congress instead generically authorized the borrowing of a bunch of money to finance its appropriations. Since this number was specified in nominal dollar terms, inflation and economic growth ensured that over time we would hit this new debt ceiling under any conceivable fiscal policy. So then Congress would raise it. And we would hit it again. Over time, a tradition of partisan grandstanding emerged. Even though the need to borrow more is driven entirely by the nexus of tax and spending laws Congress has passed, operationally the request for a higher debt ceiling must be submitted by the Treasury secretary. That’s a golden opportunity for opposition members of Congress to castigate the incumbent administration for its irresponsibility, even though everyone knows it ultimately has to be raised. Or at least they did until 2011, when Republicans coalesced around the “Boehner rule” that every dollar of increased borrowing authority should be offset by a dollar of spending cuts. The Obama administration reacted by taking the bait and trying to entice Boehner into a “grand bargain.” It didn’t work, and instead we got the Budget Control Act and the automatic sequester cuts that became part of the fiscal cliff. Initially, hopes were high in Washington that the cliff might be averted by—again—a grand bargain on the long-term deficit. But this week’s deal doesn’t do that. It extends somewhat more of the Bush tax cuts than Obama wanted to extend, offers no new spending cuts, and on the sequester it simply punted. Implementation was delayed two months until the beginning of March, thus creating a brand-new “cliff” of cuts to domestic and military programs that would hurt the economy and allegedly harm military preparedness. And while this cliff is much smaller in scale than the full cliff that was narrowly avoided on New Year’s Day, it’s much more terrifying because it will arrive in the beginning of March when we’re hitting the debt ceiling again. Or, rather, the Treasury Department says we already hit it earlier this week. For now, they can pay the government’s bills with a few accounting tricks rather than with more borrowing. But these “extraordinary measures” can only work for so long. Treasury won’t say exactly when the bag of tricks runs out, but past experience tells us it’s about two months. And this sets up an interesting collision, since the administration has sworn to the press, Senate Democrats, and yours truly that they have no intention of bargaining over the debt ceiling a second time. Their view—and it’s a correct one—is that authorizing the executive branch to pay bills that Congress has already legally required the Treasury to pay is not a “concession” to be bargained over. Even establishing the precedent that there will be bargaining over the point is dangerous since a bargain might always fail and create a disaster scenario in which there’s no way to avoid defaulting on legally valid federal obligations. 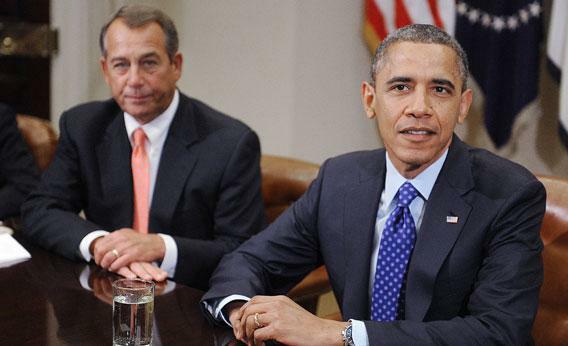 At the same time, conservative members of Congress have no intention of ditching their Boehner rule. On the contrary, recalcitrant members were induced to allow the cliff deal to pass in part on the promise of future spending cuts to come. Meanwhile, Obama’s negotiation of the fiscal cliff deal has raised grave doubts about his credibility on the debt ceiling. The deal itself is fine on the merits, but it is based on the president violating what seemed like a firm commitment not to extend tax cuts for people earning more than $250,000 a year. White House officials explained, among other things, that it was unlikely moderate Senate Democrats would really hold that line if we went over the cliff. So is the debt ceiling really any different? If House Republicans hold firm on the Boehner rule, are Democratic senators from Arkansas, South Dakota, Alaska, North Carolina, and other red states going to have Obama’s back on a no-bargaining stance? Will Obama be willing this time to hold a line that red state Democrats aren’t? I have my doubts, and House Republicans do, too. The intersection of the sequester cuts and the debt ceiling may provide a way out. Obama and the GOP could agree on a package of cuts to replace the sequester, and that legislation could also hike the debt ceiling. That would let Republicans say the debt ceiling hike was paired with spending cuts, while Obama can say he negotiated the sequester, not the debt ceiling. But that still leaves the question of what package of cuts the two sides could agree to. House Republicans have been pretty clear that they want to replace the sequester’s military cuts with cuts to anti-poverty programs, and Obama’s been very clear that he’ll agree to no such thing. Instead, he’s said any further cuts will have to be balanced by further tax increases. Back to the grand bargain in other words, even as that bargain looks no more realistic today than it did three weeks ago. In other words, the whole exhausting saga is going to go around and around. Welcome to the permanent fiscal emergency.